Fujizakura Dragon Mosaic is a 7% weizenbock from Fujizakura Kanko Heights, based in Yamanashi, Japan. It’s part of their autumn seasonal lineup and can be found in bottles and on tap when on sale. 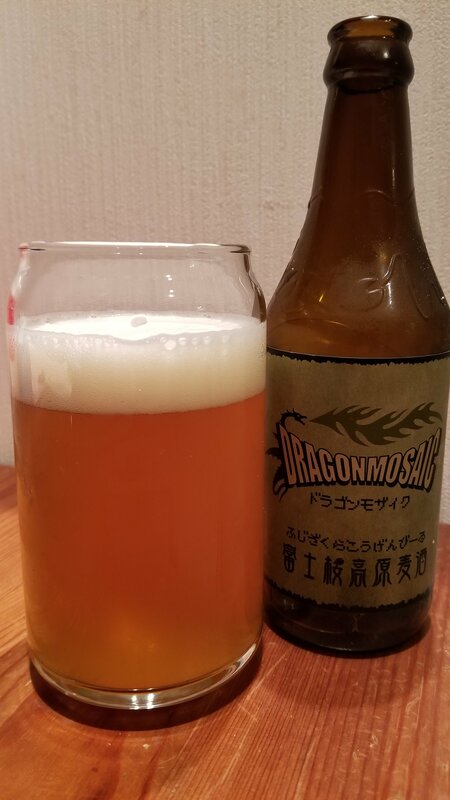 Fujizakura Dragon Mosaic is a single-hop beer with only Mosaic hops used in it. First things first, I LOVE the logo on this bottle – I mean if you are going to use Mosaic hops, then putting the logo in a mosaic form is a genius idea! But that detracts away from the beer. Fujizakura Dragon Mosaic poured out a hazy yellow orange colour with a plump white head on top that lingered throughout drinking. However, it’s the aroma that got me good. Lashings of passion fruit, oranges, peaches, bananas, and wheat coming through – a real razzle-dazzle for the nose. It only got stronger as Fujizakura Dragon Mosaic warmed up but the aromas never seemed out of balance – instead complementing one another. At 7%, Fujizakura Dragon Mosaic had some alcohol heat to it, but it was hidden exceptionally well behind all of the fruity flavours going on. The passion fruit, peaches, and bananas were such a nice contrast off one another, it was hard not to want more of Fujizakura Dragon Mosaic. It was such an interesting beer with so much going on that it tasted like a fruit salad with some alcohol added to it – something a family member would do for a joke. The sweetness from the malts came through a bit later on, but by then I was enjoying Fujizakura Dragon Mosaic too much. It finished off with a sticky fruity flourish and left me wanting more. I LOVED Fujizakura Dragon Mosaic and the only regret was that I only bought one bottle of the beer.